Single Meta menardi believed to be female found under manhole cover halfway up Ilkley Moor. Added by William Askew at 14:36 on Wed 9th May 2018. Found this one in my Wendy house. It looks quite scary. March 2012. Added by Amber Mylrea at 21:08 on Mon 19th Mar 2012. Following on from Richard Price's strange location for Meta menardi (SRS News 53), how about a garden shed? My father's small, long established, east-facing stone and slate-roofed shed backs onto a sandstone cliff face (an old quarry) in Wetheral, Cumbria (NY4654). The door of the shed is shut when not in use, so the interior is kept very dark. I hadn't been into spiders for very long, but on entering the shed on 27 December 2002, eight tell-tale 'light bulb' egg sacs were hanging from the dark roof lining. Although I had a hunch as to what the species was, I didn't have a microscope at that time, so a female specimen was sent off to Peter Harvey, who duly determined the animal. As there are no cave systems in the immediate vicinity of the site, one wonders if they previously led a subterranean existence. What other nontroglodytic places might they be lurking in? Added by John Partridge at 19:46 on Fri 24th Feb 2012. Although Meta menardi (Latreille, 1804) is known to be widely distributed in Britain, the method it employs to colonise new underground chambers remains unclear. Bats have been suggested as possible agents of dispersal (Parker, 1991), and the discovery of isolated males in more open habitats suggests that males may leave their home chamber in order to search for females (Parker, 1995). Wright (1995) proposed that transport by water courses may be a means by which this species can reach new caves. Smithers & Mckenzie (1994) noted that there is often a higher proportion of young M. menardi in the entrance region of limestone caves and postulated that this distribution may be linked with dispersal. Little information exists about the behaviour of the early life stages of M. menardi. Chapman (1992) suggested that spiderlings may move into the mesocavern cracks of underground chambers after emerging from their cocoons. Tercafs (1988) filmed spiderlings as they emerged from cocoons and noted that individuals move away from their cocoon until a suitable unoccupied space is encountered. The time taken to reach a stable distribution increased with density, as did the rate at which the spiderlings moved. Faced with this diverse range of hypotheses and observations, we decided to undertake experiments to investigate the behaviour of spiderlings following emergence from their cocoons. A simulated cave was constructed out of 2 mm thick card with a rough surface. The cave was 1.1 m long, 0.3 m high and 0.3 m wide, with a window (14x18 cm) in one end which was covered by a sheet of translucent waterproof paper, thus generating a gradient of light intensity along the length of the cave. The light levels within the cave were 0.01 KLux at the entrance, 0.002 KLux at the 55 cm point and 0.001 KLux at the far end. The cave offered six groups of crevices along one side, beginning 5 cm from the entrance, then at intervals of 11.5cm along its length. Each group comprised three crevices of widths 10, 5, 2 mm (Fig. 1). The cave was kept in a constant temperature room at 10Â°C, with a 12 hour photoperiod. In September 1995 a cocoon was collected from an abandoned mine adit near Mary Tavey in SW Devon, and suspended from the roof of the artificial cave 55 cm from the entrance. The cave was then inspected at regular intervals, using a red light to reduce disturbance. Spiderlings began to emerge from the cocoon in late February 1996. The distance from the entrance and the height above the cave floor was recorded for each spiderling at intervals of two to four days until emergence from the cocoon ceased. At the same time, each of the crevices was inspected for the presence of spiderlings. Distance from entrance: the data for each observation were grouped into five 20 cm distance classes and one (the last) of 10 cm with the entrance scored as 0 (Table 1). The 0-20 cm distance class contained the major proportion of emerged spiderlings in every sample. Analysis of variance (Anova) shows the distance classes to be significantly different (P less than 0.001). Height above cave floor: data were grouped into 5 cm height classes where zero is the cave floor (Table 2). There were significantly more spiderlings on the roof of the cave than in any of the other height classes, the mean being more than double that of other classes (P less than 0.001). The situation is complicated by the fact that spiderlings aggregated at the 0-20 cm distance class where they competed for space and filled the entrance area (Table 3). When this distance class was removed from the data, the difference between height classes became even more pronounced (P=3.23E-15). Crevices: at no time during the experiment were spiderlings observed in any of the crevices provided in the cave wall. It seems that a large percentage of spiderlings emerging from egg cocoons display a strong positive phototaxis, moving away from the cocoon towards the light of the cave entrance. As the artificial cave offered only a limited light gradient it is uncertain how far along a natural light gradient the spiderlings would have travelled. Such a behavioural pattern could, however, result in the spiderlings leaving the confines of the underground chamber. It also appears that freshly emerged spiderlings exhibit a negative geotaxis, remaining close to the chamber roof, unless competition for space forces individuals to adopt a lower position. This would ensure that the journey from the cocoon towards the chamber entrance would be conducted along the highest points of the chamber roof, thus keeping the spiderlings away from the chamber floor where they might be at risk from mammals taking shelter in such underground chambers, or from adverse conditions such as flooding. Absence of spiderlings from any of the crevices provided in the cave wall, combined with the strong positive phototactic response demonstrated by the spiderlings, suggest that early instars of M. menardi do not move into the mesocaverns of subterranean systems but migrate towards the chamber entrance. It is well known that many species of spider disperse by ballooning at the stage in their life cycle when their body mass is low (Weyman, 1993). It seems logical that if M. menardi did disperse in this fashion it would do so at an early stage in its life cycle as mature individuals are relatively large. The behaviour exhibited by the spiderlings in this experiment suggests that M. menardi spiderlings may leave the confines of the parental chamber and move outside. This migration may be undertaken to disperse in search of new underground chambers, to avoid competition with their parents and siblings, or to avoid predation by other members of the chamber community. We would like to thank Fox Smith Galleries for providing the material from which the cave was constructed and Dr J. Dalingwater for his helpful comments on earlier versions of the typescript. Peter Merrett kindly drew our attention to a paper by Pennington (1979: Bull. Br. arachnol. Soc. 4: 392-393), which focuses on the colour patterns and diurnal habits of young M. menardi near Loch Sween in Argyll. Chapman, P. (1993) Caves and Cave Life. HarperCollins, London. Parker, J. R. (1991) On the distribution and dispersal of Meta menardi (Latreille). Newsl. Br. arachnol. Soc. 60: 5-6. Parker, J. R. (1995) Meta menardi (Latreille): males on the move. Newsl. Br. arachnol Soc. 73: 5. Smithers, R & Mckenzie, P (1994) The distribution of the cave spider Meta menardi (Latreille) in a limestone cave in South Devon. William Pengellv Cave Studies Trust Newsl. 69: 21-25. Tercafs, R. (1988) Nesting dispersal in a cave spider Meta menardi. Mem. Biospeleol 15: 45-48. Weyman, G. S. (1993) A review of the possible causative factors and significance of ballooning in spiders. Ethol. Ecol. Evolution, 5: 279-291. Wright, J. (1995) Addressing Meta menardi (Latreille) Newsl. Br. arachnol. Soc. 73: 5-6. Added by John Partridge at 20:29 on Fri 24th Feb 2012. 08.02.12 Walked the sculpture trail at Tyrebagger woods, Aberdeenshire today (NJ851112). One of the sculptures is a camera obscura - a drystane cave with a damp passage leading into a central chamber. When we emerged from the cave, one of our group cried out in alarm as a Meta menardi crawled down from his hat onto his face! Fortunately neither were harmed. Everyone was fascinated by the size of this spider with the rich colouring on her legs and patterning on her abdomen. Added by Paul Edwards at 15:23 on Wed 8th Feb 2012. The spider Meta menardi is a common resident in the entrance zones of caves and mines throughout Great Britain. These habitats are utilised by relatively few invertebrates and therefore offer a limited range of potential prey items compared to the external environment. In Germany, Eckert & Moritz (1992) have identified myriapods, isopods and coleopterans as potential prey items, while Japanese workers have recorded millipedes and dipterans from webs (Yoshida & Shinkai, 1993). In Britain, millipedes, woodlice and beetles have been identified from the accumulated debris below M. menardi webs (Chapman, 1993). As part of a long term study of M. menardi, regular visits were made to both an abandoned mine adit (18 visits) and a limestone cave (24 visits) in South Devon. The mine adit also supported a population of Meta merianae in the outer entrance area. During these visits individual spiders which were encountered in the act of feeding were interrupted and the prey item removed for identification. Prey remains found in webs were also collected. During these visits notes were also made of any potential prey items encountered on the walls of the cave and mine. Some of the prey items collected were empty husks with few recognisable features remaining, thus rendering identification to species impossible. The prey items fell into six groups: millipedes, woodlice, spiders, beetles, worms and molluscs (Table 1). In order to assess the ability of webs to catch prey of different sizes, the mean distance between spiral threads was calculated for each species, by measuring the distance between spiral threads on a line that ran from the hub to the perimeter of the web. Five webs of each Meta species were measured. A table has been omitted here. Potential Prey Items Observed. Both the cave and the mine adit were used by a number of flying insects. These included mosquitoes (Cu/ex sp. ), chironomid flies, small numbers of the herald moth (Sco/iopteryx libatrix) found overwintering in both the mine and the cave, with the golden caddisfly (Stenophylax permixtus) found overwintering in the mine only. Slugs were occasionally observed in both mine and cave, while snails (Oxychi/us sp.) were seen only in the cave. Few of these potential prey were ever encountered in the webs of M. menardi although the dipterans were caught in the webs of M. merianae. Conversely very few of the recorded prey items were ever observed in either the cave or mine, indicating that they are present in low numbers. It has been suggested that the mesh size (the distance between spiral threads) of M. menardi webs is too large to ensnare dipteran prey (Eckert & Moritz, 1992). A comparison of the web mesh size of both Meta species supports this hypothesis, as the mesh of M. menardi was almost twice that of M. merianae. The mean distance between spiral threads was 4.3 mm for M. merianae and 8.3 mm for M. menardi. Small dipterans landing in a M. merianae web would be entangled by several spiral threads, whereas those falling into the web of M. menardi would encounter very few or might pass between the threads. Larger flying insects, such as the herald moth and the golden caddis, which encountered the web of either species would probably be able to break free before the spider could overpower them. It seems that M. menardi is specialising in prey that crawl over the surface of underground chambers rather than those that fly in and alight on the walls. This suggests that the web is not operating in a conventional orb web fashion. As wall-crawling prey would only encounter the perimeter of the web, this would imply that the rest of the web would normally play little part in prey capture. However, M. menardi does respond to vibrations in the web (pers. obs. ); also Yoshida & Shinkai (1993) dropped prey items into webs and these were readily consumed. The probability of prey falling from the chamber wall and landing in a web under natural conditions seems remote, as the webs are constructed parallel to the chamber walls and are usually oriented vertically. Prey items from the chamber wall are generally larger than the dipterans, although the dipterans are more abundant than the wall-crawling prey. Figure 1. Meta menardi, female with the remains of a iulid millipede. Drawing by Ivor Kenny. It appears that M. menardi has evolved a strategy that selects the less frequent but larger prey which crawl on the walls of underground chambers, in preference to the smaller but more frequent dipterans that move in from outside. However it is still able to take advantage of such prey if they become ensnared. As prey capture requires the consumption of energy, it would seem more efficient to expend energy infrequently to obtain a potentially large prey item, than to expend energy more often for a smaller return. I would like to thank the Pengelly Caving Trust for permission to conduct this work in their caves. My thanks also go to Virginia O'Conner for translating Eckert & Moritz from the original German. Eckert, R. & Moritz, M. (1992) Meta menardi (Latr.) und Meta merianae (Scop. ): Zur Lebensweise und Verbreitung der beiden haufigsten Spinnen in der Hohlen de Harzes, des Kyffhausers, Thuringens und des Zittaure Gebirges. Mitt, zoo/. Mus. Bert 68: 345-350. Yoshida, M. & Shinkai, A. (1993) Predatory behaviour and web structure of Meta menardi (Araneae: Tetragnathidae) Acta Arachnol. 42: 21-25. Added by John Partridge at 16:45 on Wed 28th Dec 2011. 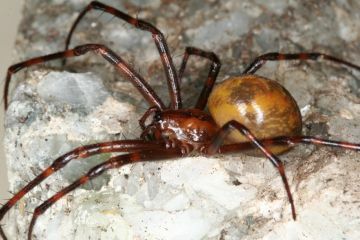 The cave spider Meta menardi has been recorded from a variety of dark and damp chambers such as caves, cellars, culverts, abandoned buildings and old mine workings (Bristowe, 1939). Populations of this species normally occur close to the entrance of the chamber where light is both low and diffuse. This area is often referred to as the twilight zone. However, individuals have been reported deep inside subterranean systems (Vainsanen, 1983), but no mention was made of the morphology of the underground passages in which they were found. Over the last two years I have explored a number of abandoned mines in the SW Devon area, during which I became interested in the distribution of the cave spiders present. A total of five mine workings were explored and the distribution of Meta menardi recorded within each. Entrance to the mines was gained via drainage tunnels known as adits and it was in these adits that the main populations of Meta menardi were found. Three of the mines explored were horizontal tunnels, but two of the adits were connected to the surface by a vertical shaft. The usual pattern of distribution observed within the horizontal tunnels was a small Meta menardi population close to the entrance of the adit with the rest of the adit devoid of spiders. The population of these entrance areas contained between five and fifteen individuals, ranging from young spiderlings to large gravid females. Of the two mines that have a vertical shaft connecting the adit to the surface, one had populations at each opening: at the adit entrance and at the foot of the shaft (the shaft is about 275 m from the entrance). In addition, three individual spiderlings were noted at distances of 20, 90 and 120 m from the shaft. The other mine with a shaft had only a small colony at the entrance which was, however, bricked up; access to the mine was by way of a hole left by the removal of two building blocks. The presence of spiders so far from an entrance aroused my curiosity and, as they only occurred where the mine was open at two points, I wondered if the presence of a shaft could lead to a movement of air through the mine when the weather conditions were favourable. This could possibly carry potential food items further into the mine than normal, thus allowing spiders that did penetrate the remoter regions of the mine to survive. If any members have other records of spiders far from an entrance or any alternative explanations of these observations I would be interested to hear from them. Bristowe, W. S. (1939) The Comity of Spiders, I. Ray Society, London. Jones, D. (1983) The Country Life Guide to Spiders of Britain and Northern Europe. Hamlyn, Feltham. Locket, G. H. & Millidge, A. F (1953) British Spiders, II. Ray Society, London. Nellist, D. R. (1976) Report on the field-week at Malham Tarn 29th May to 3rd June, 1975. Newsl. Br. arachnol. Soc. 14: 3-4. Penney, D. & Ramsay, J. (1994) A Meta menardi (Latreille) up a tree. Newsl. Br. arachnol. Soc. 70: 7-8. Roberts, M. J. (1985) The Spiders of Great Britain and Ireland, 1. Harley Books, Colchester. Vainsanen, R. (1983) The cave spider Meta menardi (Araneidae) new to Finland. Memoranda Soc. Fauna Flora Fenn. 59: 141-143. Added by John Partridge at 16:40 on Wed 28th Dec 2011. John Parker (1991) got me started on one of the curiosities of araneology when he suggested that Meta menardi may get transported to their 'addresses' phoretically on bats, though I have been unable to find any proof of his theory either in the literature or from bat experts. This does not disprove John's theory, however, and how M. menardi gets to colonise certain 'addresses' is still an unanswered question. Now even the particular type of 'address' may be open to question, with the interesting find of M. menardi under bark traps (Penney & Ramsay, 1994), though I suspect that the nearby pumping station might have something to do with this particular case. It would be interesting to carry out further work at the site mentioned to see if M. menardi is widespread in the woodland. Various authors (Locket & Millidge, 1953; Jones, 1983; Roberts, 1985) all state the same habitat preference, or 'address', for M. menardi. It is certainly my experience, and that of other araneologists, that the literature is essentially correct; however, there are always the occasional exceptions. The species is seldom taken where there is any sign of daylight, though it has been found to be well established in outbuildings at Malham Tarn (Nellist, 1976), where I saw it still thriving in 1990. Though the building is relatively dark, and is certainly damp, it is by far the brightest place I have ever seen M. menardi, with daylight spilling into the outbuilding from the front. On recent visits to the Isle of Man, where M. menardi is quite common and widespread in its more usual haunts, the brightest place I have found it has to be the Laxey Mine. The mine is now open to the public, complete with intermittent fluorescent lights, but the species tends to keep itself well into the darker recesses and deeper into the mine. All other sites on the island where I have found M. menardi have been totally dark, and very damp, one being a conduit flooded at the bottom and capped with a large concrete block. This latter site raises the question: how on earth did this small, damp and totally dark place, become so well colonised with M. menardi? Bats can be ruled out. The species was not to be found anywhere else in the immediate vicinity; just this one small conduit. As is usual, adults and immatures were sharing the same space. Could M. menardi be colonising by means of water courses? Its cuticle is quite 'waxy', and yet it obviously requires dampness to survive, so could this be a possible means of colonisation? I have done no experiments on the possible water immersion qualities and survival of M. mendardi, but my curiosity has once again been stimulated by an item in the Newsletter. Added by John Partridge at 16:36 on Wed 28th Dec 2011. During an ecology field course held at the Woodchester Park Field Station, Gloucestershire (Nat. Grid Ref. SD 812013) in late June 1993, we carried out a spider survey of three different woodland sites. Among the collecting methods employed was bark trapping: 0.5 m strips of corrugated cardboard were loosely tied around tree trunks, approximately 2 m from the ground. These were left for four days and then carefully removed to examine the underlying bark and the cardboard. This is not a technique that we have used before and we were therefore surprised and pleased to find a rather large, magnificent-looking spider clinging to the bark beneath one of the traps in a mixed woodland site. This spider was identified as a mature male Meta menardi, a holarctic species found throughout Europe and Asia as far south as the Himalayas, and North America as far south as Mexico. Checking through a selection of the available literature, we were surprised to find that this species was considered a subterranean and cave-dwelling species, requiring high humidity and darkness. In only one source (Bristowe, 1958) is it suggested that these conditions may also occur in hollow trees, otherwise no mention of trees is made at all. Only two trees in the wood were sampled, so it came as even more of a surprise to have caught this spider. The site had a domed top canopy and there were a number of young trees and shrubs present. The herb layer was around knee height and present over most of the forest floor. Physical features included vertical vines hanging from trees, dead and decomposing logs and a decaying leaf litter covering most of the ground. A pumphouse was situated by the edge of the site, constantly pumping out water, possibly providing the high humidity favoured by this species. We feel that it would be interesting to do a more extensive survey of bark trapping and possibly tree fogging in this and similar sites to try to determine whether this was a one-off find, or whether this spider occupies another niche which may have been overlooked. A sub-adult male was also found in the more usual situation, under a loose board covering a drain from the field centre. Added by John Partridge at 16:32 on Wed 28th Dec 2011. Between sessions at an international arachnological congress some years ago, two or three of the members were talking together when the conversation turned to the apparent rarity of certain araneids such as Araneus angulatus Clerck and Araneus a/sine Walckenaer. I remarked that only once had I found each of these species, in the South of England. Both species also occur in Scandinavia and someone from that region said that he too had rarely found these species until he became knowledgeable about their 'address'. By this he meant the precise habitat requirements of each species, which in the case of the former is woodland with a tall understorey of evergreen shrubs, and in the latter case open areas of tall herbs and grasses which are never mown. Few spiders are more specific about their 'address' than Meta menardi which requires a subterranean situation with high humidity and almost complete darkness, and without those extremes of seasonal temperatures which occur in open exposed places. These can be damp caves in woodlands, old mine shafts, underground passages, grottos, Victorian ice-houses and below loose boards covering old drains and water meters, or, sometimes above ground level in disused, dilapidated, leaky outbuildings with sealed doors and boarded-up windows. I first found this large chestnut-brown spider at a Derbyshire hotel which has a late seventeenth century stone plunge bath in a cellar with a vaulted roof. The bath, just big enough for a swim, was constantly supplied by a thermal spring with a temperature of 68Â°F, and the overflow ran down an open channel in a long underground passage towards the river. The decaying door at the far end was rarely opened and holes provided only a glimmer of light. The passage, cut out of the solid rock, was always full of steamy vapour and it was not considered safe to touch the light switches with bare hands! In this dank, muggy situation there was a thriving colony of the spiders. The large adults were suspended in small openmeshed orb webs, glistening with minute droplets of condensed vapour. Because their habitat is not subject to seasonal changes, these spiders, unlike most other araneids, have no seasonal period of development towards maturity. At all times of the year the colonies include egg sacs, newly hatched spiders in tiny webs, immatures, sub-adults and adults of both sexes. The habitats occupied by the spiders may be many miles apart and these very local colonies may have been established for hundreds of years. But how do the man-made artefacts become colonised by spiders requiring a specific environment? No doubt colonies do get wiped out by changing conditions. For about 100 years there has been a chalybeate spa at Trefriw in the Conwy valley in North Wales where the clear spring water was credited with medicinal properties due to iron salts in solution and, like those of other spas, people came to take the waters. A small pump room with glazed windows was built to commercialise the site. This was closed during the last war when the windows were boarded up, but it has been re-opened in recent years as a tourist attraction. When the boarding was removed there was a very extensive colony of M. menardi all along the cornice and some hundred or so white egg sacs suspended from the ceiling. But the spiders did not like the light or the increased temperature from sunlight through the glass windows and they soon disappeared. The eggs in the sacs did not hatch and the last time I was there the sacs were still to be seen. Now only a few of the spiders can be found and these are in the small dark underground grotto from which the spring emerges. Obviously the spiders do disperse and colonise new sites. But how? Transportation by man or by aerial dispersal between sites many miles apart is extremely unlikely. Quite recently I think 1 may have solved the problem. Adjacent to what was once a large Cumbrian country mansion house there is an old Victorian icehouse about 15 yards long sealed by a locked door at one end and with an iron grille gate at the other. Before the days of refrigerators, ice was cut in winter and stacked to the ceiling of the ice house for use during the summer. Away from the light it now has a considerable colony of M. menardi adjacent to which is the summer roost of some thirty-five to forty noctule bats whose winter hiberation roost is elsewhere. Long-eared bats also use the ice-house, not as a roost but as a resting place to consume their prey, particularly yellow underwing moths taken on summer evenings in the grounds of the house. The evidence is left on the floor where there is a mosaic of hundreds of bitten-off wings of noctuid moths. It seems obvious that the spiders are not preyed upon by these bats which are clean mammals and spend long periods grooming their fur like a fastidious cat. But they do have their own ectoparasites such as fleas, some of which are apparently host-specific species and a wingless bloodsucking fly Nycteribia biarticulata Hermann which lives in their fur. These flies leave their hosts to deposit their larvae on walls where they immediately pupate (Colyer & Hammond, 1951). Tiny mites are also carried around on the heads of bats (Matthews, 1952). It seems very likely that minute newly hatched spiders may reach the torpid roosting (or resting) bats and creep into their fur. M. menardi spiderlings are known to use strands of their silk for aerial dispersal (Bristowe, 1939). They might be lifted away from the egg cocoon by air currents within their habitat. The spiders could therefore be phoretically dispersed by the bats to other roosts or even further away on their migration and could be brushed off the bodies of the bats during grooming. Small underground sites could be colonised from the little pipistrelle bats which alight on the ground to take insects and investigate small holes and crannies as roosting places. While the bats referred to above might not eat cave spiders, it has to be said that the remains of M. menardi spiders have been recorded in the droppings of horseshoe bats which hibernate in caves (Matthews, 1952). Bristowe, W.S. (1939) The Comity of Spiders I. Ray Society, London. Colyer, C. N. & Hammond, C. O. (1951) Flies of the British Isles. Wame, London. Matthews, L. H. (1952) British Mammals. Collins, London.